3. Department of Dermatology, Hokkaido University Graduate School of Medicine, Sapporo, Japan. Background: The prognosis of angiosarcoma is poor and a novel treatment option for the disease is desired. The aim of this study was to investigate the prognostic significance of Forkhead box M1 (FOXM1), a transcription factor that regulates cell-cycle progression and various crucial processes in tumor progression, and its potential as a new therapeutic target. Methods: We investigated 125 angiosarcoma clinical samples (94 primary lesions and 31 metastatic lesions in 94 patients) and a human angiosarcoma cell line (HAMON) using immunohistochemical staining and molecular biological approaches. 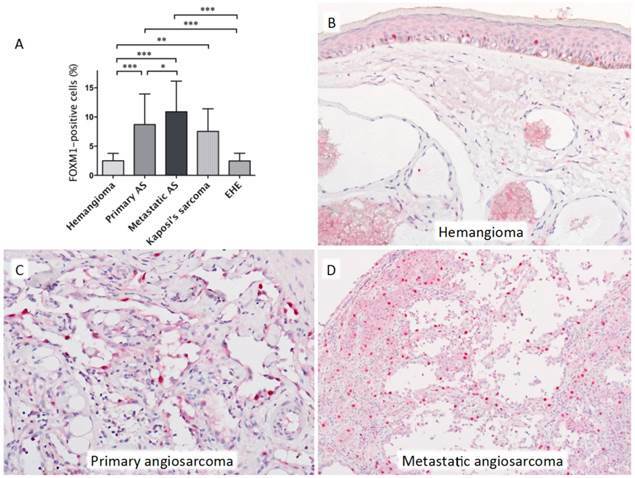 FOXM1 expression in angiosarcoma samples was also compared with that in Kaposi's sarcomas (n = 13), epithelioid hemangioendotheliomas (n = 13) and benign hemangiomas (n = 10). Results: Patients with FOXM1-overexpressing angiosarcoma had significantly shorter survival (both for disease-specific survival [DSS] and event-free survival [EFS]) than other patients (5-year DSS, 23.5% vs. 47.1%, P = 0.013; and 5-year EFS, 5.5% vs. 28.7%, P = 0.004). FOXM1 overexpression was also an independent prognostic factor for both DSS and EFS in Cox multivariate analyses (hazard ratio [HR] 2.84, 95% confidence interval [CI] 1.10-5.81, P = 0.039; and HR 4.16, 95%CI 2.03-8.67, P = 0.0001, respectively). 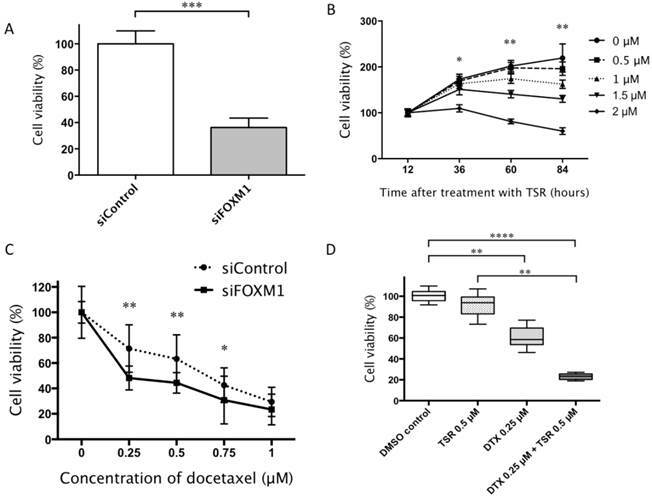 FOXM1 inhibition using both small interfering RNA and a specific inhibitor (thiostrepton) suppressed cell proliferation of the angiosarcoma cell line. Furthermore, FOXM1 inhibition improved the chemosensitivity to docetaxel in vitro. Conclusions: FOXM1 inhibition may be a potential therapeutic option for angiosarcoma. Keywords: Forkhead box M1, angiosarcoma, Kaposi's sarcoma, prognosis, treatment, siRNA, docetaxel, thiostrepton. Angiosarcoma is a rare, malignant vascular sarcoma accounting for <2% of all soft tissue sarcomas,1 and is one of the most aggressive malignant tumors. The prognosis of angiosarcoma is dismal with a 5-year survival rate of 10-35%.2-4 The therapy for angiosarcoma requires a multimodal approach, including surgical resection, radiotherapy, and chemotherapy.2, 5-7 Although recent emerging molecular-targeted therapies have yielded some advances in the treatment of angiosarcoma patients, the prognosis is still poor.8-10 Therefore, a new treatment option for advanced angiosarcoma is still desired. Forkhead box M1 (FOXM1) is a member of the FOX family of transcription factors and is widely expressed in embryonic tissues.11-13 Controlled FOXM1 expression and activity provides a balanced transcriptional program to ensure proper growth and maturation throughout embryonic and fetal development, as well as during adult tissue homeostasis and repair. FOXM1 also regulates crucial processes in both development and tumor progression, including stem cell renewal, cell proliferation, tumor progression, cell migration, tumor metastasis, epithelial-mesenchymal transition, angiogenesis, and chemoresistance.11-13 Previous studies have revealed that FOXM1 is overexpressed in various cancers and sarcomas such as breast cancer, lung cancer, pancreatic cancer, glioblastoma, and non-Hodgkin's lymphoma.12-17 Overexpression of FOXM1 is a poor prognostic factor in many of these tumors. In contrast, limited information is available on the association of FOXM1 expression in angiosarcoma, and its role in tumorigenesis or tumor progression has not been fully elucidated. In this study, we first examined FOXM1 overexpression in clinical specimens by immunohistochemistry to investigate the prognostic significance of FOXM1 in angiosarcoma patients. Furthermore, we performed in vitro assays using an angiosarcoma cell line, thereby demonstrating the potential of FOXM1 as a new therapeutic target. This study was conducted in accordance with the principles embodied in the Declaration of Helsinki, and was approved by the Ethics Committee of Kyushu University (No. 27-78). We examined 125 paraffin-embedded angiosarcoma clinical samples (94 primary lesions and 31 metastatic lesions in 94 patients) registered in the Department of Anatomic Pathology, Graduate School of Medical Sciences, Kyushu University, Japan, between 1971 and 2014. We also investigated FOXM1 expression in 13 samples of epithelioid hemangioendothelioma, 13 samples of Kaposi's sarcoma and 10 samples of benign hemangioma for comparison. Clinical and demographic data were retrieved from the patient files. Patients with epithelioid hemangioendothelioma, Kaposi's sarcoma and benign hemangioma were excluded from all of the survival analyses. Follow-up data were available for 59 angiosarcoma patients; at the last follow up, 29 patients were alive, 17 of whom had not experienced metastasis, 30 patients had died of angiosarcoma, and none had died of other causes. Patients included in the survival analyses were relatively recent cases and primarily underwent radiation therapy (45-85 Gy), followed by taxane-based chemotherapy or intravascular interleukin-2 injection without the radical surgical treatment. Total resection of the primary tumor was performed in only six patients; all six of their primary angiosarcomas were successfully excised with negative surgical margins. Disease-specific survival (DSS) and event-free survival (EFS) were calculated from the date of the first histopathological examination to the date of death due to angiosarcoma, or the date of recurrence or metastasis. Data of patients without death or recurrence were censored on the date of the last follow-up before March 31, 2015. The median follow-up periods were 18 months (mean, 27.2 months) for DSS and 14 months (mean, 22.1 months) for EFS. For surviving patients, the median follow-up period was 28 months (mean, 35.6 months). All samples were fixed with 10% buffered formalin. The archival paraffin-embedded tissue blocks were cut into 3-μm-thick tissue sections. The sections were deparaffinized with xylene for 10 min and rehydrated through a graded ethanol series. Antigen retrieval was performed using Heat Processor Solution pH6 (Nichirei Biosciences, Tokyo, Japan) at 125°C for 10 min by a pressure cooker, and non-specific binding was blocked using the supernatant of 1% skimmed milk. The sections were then incubated with a rabbit antibody against human FOXM1 (1:1000, Santa Cruz Biotechnology, Santa Cruz, CA) and Ki-67 (1:100, DAKO, Glostrup, Denmark) at 4°C overnight, followed by incubation with the secondary antibody, N-Histofine Simple Stain AP MULTI (Nichirei Biosciences). Immunodetection was conducted with a standard streptavidin-biotin amplification method and 3-amino-9-ethylcarbazole as a chromogen, followed by light counterstaining with hematoxylin. Sections stained without primary antibody served as a negative control. Human angiosarcoma HAMON cells21 were cultured in Endothelial Cell Growth Medium (EGM-2 BulletKit; Lonza, Basel, Switzerland). HAMON is Cells were grown in culture dishes at 37°C, 5% CO2. The culture medium was replaced every 2 days. At near confluence (70-90%), the cells were disaggregated with 0.25 mg/ml trypsin/0.01% ethylenediamine tetraacetic acid and subcultured. Docetaxel was purchased from Wako Pure Chemicals (Osaka, Japan), and thiostrepton, a FOXM1 inhibitor, was obtained from Millipore (Bedford, MA, USA). Both drugs were dissolved in dimethyl sulfoxide (DMSO; Sigma-Aldrich, St. Louis, MO, USA) and were used at the indicated concentrations. The angiosarcoma cells were transfected with On-Target plus Smart Pool siRNAs FOXM1 and On-Target plus Smart Pool siRNAs siControl (GE Healthcare, Buckinghamshire, UK.) using Lipofectamine RNA imax (Invitrogen, Carlsbad, CA, USA) according to the manufacturer's protocols. Angiosarcoma cells were seeded in 6-well plates at a concentration of 1 × 105 cells per well in antibiotics-free medium and transfected with 10 pmol siRNAs. The transfection of the siRNA for FOXM1 (siFOXM1) was confirmed by quantitative reverse transcription-polymerase chain reaction (qRT-PCR) and immunoblotting. We performed qRT-PCR for FOXM1, which was analyzed using TaqMan assay reagents (FOXM1 Hs00170471_m1. ; GAPDH Hs99999905_m1. ; Applied Biosystems, Foster City, CA, USA) on an ABI Prism 7700 Sequence Detection system (Applied Biosystems). The PCR was carried out according to the manufacturer's protocol. The FOXM1 expression levels were standardized based on expression of the housekeeping gene GAPDH. All of the reactions for each sample were performed at least in triplicate. The data were averaged from the values obtained in each reaction. Angiosarcoma cells were incubated with lysis buffer (Complete Lysis-M, Roche Applied Science, Indianapolis, IN, USA). The lysate protein concentration was measured using a BCA Protein Assay kit (Pierce, Rockford, IL, USA). Equal amounts of protein (20 µg) were dissolved in NuPage LDS Sample Buffer (Invitrogen) and 10% NuPage Sample Reducing Agent (Invitrogen). Lysates were boiled at 98°C for 2 minutes and loaded and run on 4-12% NuPage Bis-Tris Gels (Invitrogen) at 200 V for 40 minutes. The proteins were transferred onto polyvinylidene fluoride membranes (Invitrogen) and blocked in 2% bovine serum albumin in 0.1% Tween-20 (Sigma-Aldrich) and Tris-buffered saline. The membranes were probed with anti-FOXM1 antibody (1:100, Santa Cruz) overnight at 4°C. The secondary antibody used was anti-rabbit horseradish peroxidase-conjugated IgG antibody. Anti-human actin mouse monoclonal antibody (1:4000, Millipore) was used as a loading control. Protein bands were detected using the ImageQuant LAS 4000 system (GE Healthcare). Cell viability was assessed using Cell Counting Kit 8 (CCK-8, Dojindo Molecular Technologies, Rockville, MD, USA) according to the manufacturer's instructions. The absorbance at 450 nm was spectrophotometrically measured with a microplate reader (Model 680, Bio-Rad Laboratories, Hercules, CA, USA) at 450 nm. Twenty-four hours after siRNA transfection, the transfected cells were seeded at a density of 5000 cells per well in 96-well plates. For the proliferation assay, the number of viable cells in each well was measured at 36, 60, and 84 hours after transfection using CCK-8 (Dojindo). The angiosarcoma cells were seeded on 96-well plates at a concentration of 3000 cells per well in serum-containing growth medium. After a 12-hour incubation, the cells were treated with carrier alone (0.01% DMSO) as a non-treated control or with various concentrations of thiostrepton for another 72 hours. The resulting data are reported as the percentage of cell viability in comparison to that of the respective non-treated control group (100%). For the chemosensitivity assay, we added docetaxel (0.25 μM or 0.5 μM) with or without thiostrepton (0.5 μM) and measured the number of viable cells after another 72 hours using CCK-8 (Dojindo). The concentrations of these agents were determined based on a pilot assay. Assays were conducted in triplicate and were repeated at least three times in separate experiments. All statistical analyses were performed using the JMP Pro statistical software package (version 11.0, SAS Institute, Cary, NC, USA) and the GraphPad Prism statistical software package (version 6, GraphPad Software, San Diego, CA, USA). The associations between FOXM1 expression and other clinicopathological parameters, including age, gender, primary tumor site, definite cause, histopathological type, and TNM stage, were assessed using the χ2 or Fisher exact test as appropriate. We used the Kaplan-Meier method to evaluate DSS and EFS, and compared survival curves using the log-rank test. The influence of FOXM1 expression on survival was also analyzed using multivariate Cox proportional hazards regression models. The risk factors (covariates) were considered to be FOXM1 expression, age, gender, primary tumor site, histopathological subtype, and TNM stage. Cell viabilities were analyzed by one-way analysis of variance (ANOVA) followed by Dunn's multiple comparison post-hoc test or the Mann-Whitney U-test as appropriate. A P-value of less than 0.05 was considered to indicate statistical significance. We investigated 125 angiosarcoma clinical samples (94 primary lesions and 31 metastatic lesions in 94 patients) and 13 Kaposi's sarcoma clinical samples (13 patients); 63 patients (58.9%) were male and 44 (41.4%) were female, with a mean age of 66.3 years. Primary tumor sites were the skin in 76 tumors (71.0%) and other sites in 31 tumors (29.0%). Radiation-induced angiosarcoma was noted in one patient (0.9%) and lymphedema-associated angiosarcoma (Stewart-Treves syndrome) was confirmed in three patients (2.8%). Histopathologically epithelioid features were observed in 17 patients (15.9%). We did not distinguish two phenotypes of angiosarcoma (lymphangiosarcoma and hemangiosarcoma) because of the insufficient assessment from small clinical samples. Representative histopathological images of benign hemangioma and angiosarcoma are shown in Figure 1. Benign hemangiomas and epithelioid hemangioendotheliomas rarely expressed FOXM1, whereas it was frequently expressed in angiosarcomas and Kaposi's sarcomas. Statistically significant differences in FOXM1 expression were observed between benign hemangioma and primary angiosarcoma, metastatic angiosarcoma, and Kaposi's sarcoma, respectively (one-way ANOVA followed by Dunn's multiple comparison post-hoc test; P < 0.001, P < 0.001, and P < 0.01, respectively). Epithelioid hemangioendothelioma less frequently expressed FOXM1 than primary angiosarcoma and metastatic angiosarcoma (P < 0.001, P < 0.001, respectively). FOXM1 expression was observed significantly more frequently in metastatic angiosarcomas compared with the primary tumors (P < 0.05). A: Statistically significant differences in FOXM1 expression were observed between samples of benign hemangioma and primary angiosarcoma (AS), metastatic AS, and Kaposi's sarcoma, respectively. Epithelioid hemangioendothelioma (EHE) less frequently expressed FOXM1 compared with primary AS and metastatic AS. There was also a significant difference between primary and metastatic AS (one-way ANOVA followed by Dunn's multiple comparison post-hoc test; *P < 0.05, **P < 0.01 and ***P < 0.0001). Error bars: standard deviation (SD). B: A representative image of a benign hemangioma of the skin showing negative FOXM1 expression. Note the strong and frequent nuclear expression of FOXM1 in the epidermal keratinocytes. C: Primary angiosarcoma showing strong FOXM1 expression. D: Metastatic angiosarcoma showing strong FOXM1 expression. A: A significant correlation between FOXM1 and Ki-67 expression was observed. B: The Kaplan-Meier curves of angiosarcoma patients. Patients with FOXM1-high angiosarcoma had significantly shorter disease-specific survival than those without high expression (5-year survival, 23.5% vs. 47.1%; P = 0.013). C: Patients with FOXM1-high angiosarcoma had significantly shorter event-free survival than those without high expression (5-year survival, 5.5% vs. 28.7%; P = 0.004). Since FOXM1 is reportedly associated with cell-cycle progression, we next examined the relationship between FOXM1 and Ki-67 expression, a cell-proliferation marker. A significant correlation was noted between the two markers (R2 = 0.439, P < 0.0001; Fig. 2A). Table 1 shows the associations of clinicopathological factors with immunohistochemical FOXM1 expression. Among these factors, advanced TNM stage was significantly correlated with high FOXM1 expression (P = 0.041). Patients with angiosarcoma and high FOXM1 expression had a significantly shorter DSS (5-year survival, 23.5% vs. 47.1%; P = 0.013; Fig. 2B) and EFS (5-year survival, 5.5% vs. 28.7%; P = 0.004; Fig. 2C) than those without high expression. We next examined whether FOXM1 affects DSS and EFS in the subgroups of non-advanced angiosarcoma (TNM stage I or II) and advanced angiosarcoma (TNM stage III or IV) patients. Among the patients with non-advanced anigosarcoma, FOXM1 positivity was significantly correlated to the shorter DSS and EFS (P=0.049 and P=0.014, respectively; Supplemental Fig. S1). As for the patients with advanced angiosacoma, the difference of DSS and EFS between FOXM1-positive and FOXM1-negative patients did not reach the statistical significance (P=0.709 and P=0.546, respectively). Factors associated with FOXM1 expression. Significant value is shown in bold. The results of the Cox multivariate analyses for DSS and EFS in angiosarcoma patients are shown in Tables 2 and 3, respectively. In addition to the FOXM1 expression, we chose four variables (age, gender, primary tumor site and TNM stage) that are clinically important and reported to be possible prognostic variables.2-6 We excluded the histopathological subtype and histopathological degree of differentiation, which are also potential prognostic variables, from the multivariate analyses because most of the paraffin sections were too small in size (punch biopsy specimens) to be fully assessed histopathologically. The Ki67 labeling index was also excluded from the model because of the strong correlation with the FOXM1 expression. Among the variables included in the multivariate analyses, the independent prognostic factors for DSS were patient age (P = 0.003), non-skin primary lesion (P = 0.002), and FOXM1 overexpression (P = 0.039). With regard to EFS, the independent prognostic factors were male gender (P = 0.003), non-skin primary lesion (P < 0.0001), advanced TNM stage (P < 0.0001), and FOXM1 overexpression (P = 0.0001), as shown in Table 3. We next examined the influence of FOXM1 on angiosarcoma cells in vitro using transfection siFOXM1 and a FOXM1 inhibitor, thiostrepton, which were confirmed by qRT-PCR and western blotting, respectively (Supplemental Fig. S2). siFOXM1-transfected HAMON angiosarcoma cells showed reduced cell viability compared to control siRNA-transfected cells (P < 0.01; Fig. 3A). Likewise, thiostrepton reduced the cell viability of the angiosarcoma cell line in a dose-dependent manner (Fig. 3B). Factors associated with disease-specific survival (DSS) in the Cox multivariate analyses. a Expressed as a continuous variable. A: siFOXM1-transfected cells showed reduced cell viability than control siRNA-transfected cells (Mann-Whitney U-test; ***P < 0.001). B: Thiostrepton (TSR) reduced cell viability in a dose- dependent manner. We compared the cell viabilities of each group treated with various TRS concentrations at 36, 60 and 94h (one-way ANOVA followed by Dunn's multiple comparison post-hoc test; *P < 0.05 and **P < 0.01). C: siFOXM1-transfected cells showed suppressed cell viability in response to lower concentrations of docetaxel. We compared the cell viabilities of siFOXM1 to those of siControl at the docetaxel concentrations of 0.25, 0.5, 0.75 and 1.0 μM (Mann-Whitney U-test; *P < 0.05 and **P < 0.01). D: Cells treated with both thiostrepton and docetaxel (DTX) showed reduced viability than those treated with DMSO or TSR alone at 72 hours after the treatment. The cells treated with both thiostrepton and docetaxel also showed significantly lower cell viability compared with cells treated with thiostrepton alone. There was no significant difference in cell viability between DMSO-treated cells and thiostrepton-treated cells (one-way ANOVA followed by Dunn's multiple comparison post-hoc test; **P < 0.01 and ****P < 0.0001). Error bars: SD. Factors associated with event-free survival (EFS) in the Cox multivariate analyses. We next tested whether FOXM1 inhibition affects the chemoresistance in angiosarcoma cells. Both siFOXM1-transfected cells and thiostrepton-treated cells showed suppressed cell proliferation in significantly lower concentrations of docetaxel, compared to their controls (P < 0.01, respectively; Fig. 3C, 3D). Of note, the cells treated with both thiostrepton and docetaxel showed the lowest viability among groups treated with DMSO, thiostrepton alone, or docetaxel alone at 72 hours after the treatment. The cells treated with both thiostrepton and docetaxel demonstrated significantly lower cell viability compared to those treated with DMSO or thiostrepton alone (P < 0.01 and P < 0.0001, respectively). The difference in cell viability between cells treated with docetacel alone and docetacel with thiostrepton did not reach statistical significance. There was also no significant difference in cell viability between DMSO-treated cells and thiostrepton-treated cells (Fig. 3D). The present study revealed several important findings. First, FOXM1 overexpression detected by immunohistochemistry was significantly correlated with a poor outcome for angiosarcoma patients. Patients with FOXM1-high angiosarcoma had a significantly shorter survival period with respect to both DSS and EFS than those with FOXM1-low angiosarcoma. High FOXM1 expression was also an independent adverse prognostic factor of DSS and EFS in Cox multivariate analyses. In the subgroup analyses on patients with non-advanced angiosarcoma, FOXM1 positivity was significantly correlated to the shorter DSS and EFS. These results are in good accord with previous studies on other malignant tumors that demonstrated a close association between FOXM1 expression and dismal prognosis, and indicate the prognostic significance of FOXM1 in angiosarcoma. Another interesting finding is that FOXM1 was more frequently expressed in angiosarcomas than in benign hemangiomas, and was rarely expressed in hemangiomas. Furthermore, metastatic angiosarcomas showed significantly higher levels of FOXM1 than primary angiosarcomas. On the basis of these results, we speculate that FOXM1 might play important roles in tumorigenesis and tumor progression in angiosarcoma, suggesting its potential as a possible therapeutic target. The significant immunohistochemical correlation between Ki-67 and FOXM1 expression provides further support for the involvement of FOXM1 in tumor progression. FOXM1 expression was also frequently observed in the Kaposi sarcomas in this study. Recent studies suggest that human herpesvirus 8 promotes the tumorigenesis of Kaposi sarcoma by modulating the Hippo pathway.22 FOXM1 has been shown to be a target of Yes-associated protein (YAP), a downstream effector of the Hippo pathway, in some sacromas,23 and deregulation of the Hippo pathway has been shown to promote FOXM1 expression and tumorigenesis.23 These findings may suggest a correlation between FOXM1 and the Hippo pathway in the tumorigenesis of vascular sarcomas. Moreover, the FOXM1-inhibitory condition improved the chemosensitivity of angiosarcoma cells to docetaxel. The first-line chemotherapy for advanced angiosarcoma is generally based on taxanes.5-7 Angiosarcoma most commonly arises on the skin of the head and neck regions, and previous studies suggest that taxanes are particularly effective for head and neck angiosarcoma compared with angiosarcoma of other regions. Docetaxel is a typical taxane and is widely used for the treatment of angiosarcoma; however, a reduced dosage of docetaxel would be favorable to minimize its adverse effects. Our present in vitro assay demonstrated that FOXM1 interruption by siRNA led to a reduction in cell proliferation at lower concentrations of docetaxel. Similar results have been reported in gastric cancer.26 The results of that study, it is suggested that FOXM1 directly targets and up-regulates a microtubule-destabilizing protein Stathmin, and then prevents the tubulin polymerization, eventually mediating the resistance to docetaxel-induced apoptosis, and that the FOXM1-induced resistance to docetaxel can be reversed by the FOXM1 inhibition using thiostrepton.26 Improved chemosensitivity was also achieved by thiostrepton treatment in our study, and we speculated that similar mechanisms might be at work in the synergistic effects of thiostrepton and docetaxel in angiosarcomas. Our results from clinical samples and in vitro assays of angiosarcoma are in good agreement with the reported mechanisms of FOXM1 in other malignancies. Ideally, therapeutic intervention should be minimally toxic to normal tissues, and a FOXM1 inhibitor may be suitable from this aspect, because normal adult tissue express low levels of FOXM1. The single use of thiostrepton or a combination of conventional chemotherapy could be another therapeutic option for angiosarcoma showing FOXM1 overexpression. In addition to the inherent potential biases of a retrospective collection of the patient data, one major limitation of the present study is the relatively small number of patients with available follow-up data. Some of the patients had an extremely short DSS and EFS, and the results of the multivariate analyses should be interpreted with caution. In summary, we have shown that FOXM1 inhibition is a candidate treatment for angiosarcoma based on the results of our clinicopathological assessment and in vitro study. 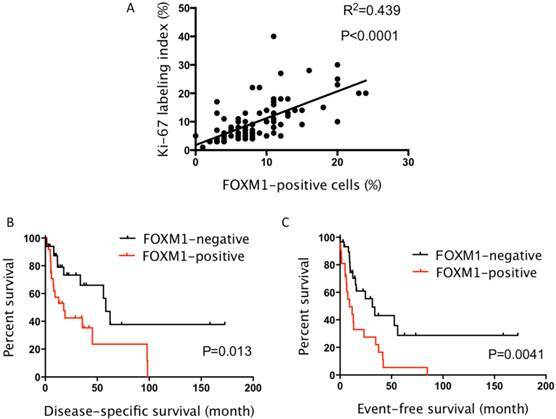 FOXM1 may be involved in angiosarcoma progression in various ways, and further in vivo and in vitro investigations are warranted to evaluate the efficacy of FOXM1 inhibition alone or in combination with other agents. CI, confidence interval; DSS, Disease-specific survival; EFS, event-free survival; FOXM1, Forkhead box M1; HR, hazard ratio. The authors thank all of the patients, and the members of our laboratory. This work was partly supported by JSPS KAKEN Grant Number 25293088. Corresponding author: Yoshinao Oda, MD, PhD. Address: Department of Anatomic Pathology, Graduate School of Medical Sciences, Kyushu University, 3-1-1, Maidashi, Higashi-ku, Fukuoka 812-8582, Japan. Tel. : (81) 92-642-6061, Fax: (81) 92-642-5968, E-mail: odamed.kyushu-u.ac.jp.